Sul cittadino di Adelaide si decide il campionato: Mansell , Prost e Piquet si giocano il titolo. I due piloti della Williams partono in prima fila, dietro la Lotus di Senna e la Mclaren di Alain, quindi Arnoux (Ligier) e Berger (Benetton). Al via scatta bene Senna, ma viene presto superato e si alternano in tanti al comando; Prost è costretto ai box da una foratura ed è la sua fortuna perchè si scoprirà che le Goodyear non resistono per tutta la gara. Infatti prima Rosberg (dechappamento) e poi Mansell (scoppio) sono costretti al ritiro per le gomme e Piquet le cambia per precauzione. Vince dunque Prost gara e titolo, davanti a Piquet e Johansson (Ferrari). Qualità ottima, commento in inglese. 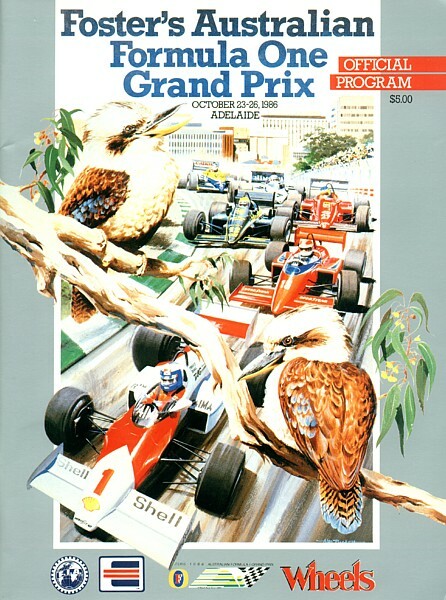 The city of Adelaide will decide the championship: Mansell, Prost and Piquet will play the title. The two Williams drivers start in the front row, behind Senna's Lotus and McLaren of Alain, and Arnoux (Ligier) and Berger (Benetton). Senna at the start off well, but is soon overcome and in many alternate command; Prost was forced to the pits by a puncture and it is his luck because you will find that Goodyear can not stand for the whole race. In fact, before Rosberg (dechappamento) and then Mansell (bursts) are forced to retire because of changes to the tires and Piquet as a precaution. So Prost wins race and title, ahead of Piquet and Johansson (Ferrari). Best Quality, commentary in English. Город Аделаида решит чемпионата: Мэнселл, Прост и Пике будет играть титул.Два Уильямс драйверов начать в первом ряду, позади Лотос Сенна и McLaren Алена, и Арну (Ligier) и Бергер (Benetton). Сенна на начинаете хорошо, но в скором времени преодолены, и во многих альтернативных команд; Прост был вынужден ямы на прокол и это его счастье, потому что вы увидите, что Goodyear не может баллотироваться на весь род. На самом деле, прежде чем Росберг (dechappamento), а затем Мэнселл (очередей) вынуждены уйти в отставку из-за изменений в шинах и Пике в качестве меры предосторожности. Так Прост победы гонки и титул, опередив Пике и Йоханссон (Ferrari). Лучшее качество, английским комментарием.